Silver Ships, Inc. all-aluminum workboats are designed and constructed with your mission in mind. A high-quality workboat is an important investment, and our team is dedicated to providing our customers with the perfect vessel for their needs. Silver Ships is a premier builder of high-quality, cutting-edge workboats used for Fire/Rescue, law enforcement, military patrol, surveying and other applications. Our signature series of boats have a proven and successful track record of high quality, durability and speed, with custom options available based on customer needs. Our special application boats are designed and built to perform at the highest level and succeed even in the most intense circumstances, no matter the mission. Our vision has always been to provide customers with a boat designed, built and outfitted to best suit their operational needs. We build boats that are custom designed from start to finish to meet and exceed our customers’ expectations. 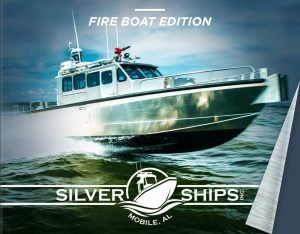 Silver Ships all-aluminum fire boats are designed and manufactured to accommodate individual fire-fighting and rescue missions. View our interactive fire boat edition eBook to learn more. We’ll build a boat with your mission in mind.